ABS-CBN flagship AM station DZMM sheds hope in the light of Typhoon Yolanda tragedy as it launched its Christmas Station ID “DZMM Magkasama Tayo sa Kwento ng Pasko” that commemorates Filipinos’ optimism and courage to rise from disasters and trials last Monday (Nov. 25). DZMM continues its commitment to serve, especially now that the country is rising from the aftermath of super typhoon Yolanda, by working hand-in-hand with the Sagip Kapamilya's relief operations and opening its communication lines for donations and inquiries. To light a spark of hope in Filipinos' hearts, DZMM anchors and reporters came together and sang with one voice for its station ID theme song. Among the anchors and reporter who performed were Noli de Castro, Korina Sanchez, Julius Babao,Henry Omaga-Diaz, Jing Castañeda, Doris Bigornia, Winnie Cordero, Ariel Ureta, Peter Musngi, Bernadette Sembrano, Kaye Dacer, Bro. 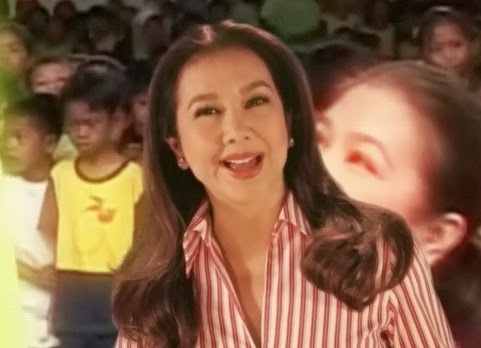 Jun Banaag, Pat-P Daza, Carl Balita, Joey Lina, Ambet Nabus, Ahwel Paz, MJ Felipe, Ogie Diaz, Jasmine Romero, Toni Aquno, May Valle-Ceniza, and Traffic Angels Tina, Bea and Barbie, along with ABS-CBN president and CEO Charo Santos-Concio. The station ID theme song is written by Shally Tablada and Lloyd Oliver Corpuz with music by Raizo Chabeldin and Genevieve de Vera. DZMM’s 2013 Christmas Station ID was created by ABS-CBN Creative Communications Management, who was also behind the viral 2013 Christmas station ID of ABS-CBN, headed by Robert Labayen, Christina Barbin and Miriam Anaten-Ramos. It is directed by Paolo Ramos. The SID Creative and Production team members are Tablada, Corpuz, Steph Angeles at Christian Abuel; with ABS-CBN Integrated News and Current Affairs head Ging Reyes, DZMM Station Manager Marah Faner-Capuyan, and executive producers TJ Correa and Shiela Tubalinal. Other members are Technical Production head Jaime Porca; Production Designer Andrew Go; Post Production Team Deniis Amarille, Allan Bien, Merryl Tan, Oliver Paler and Lawrence Macanaya; Talent Caster Mary Jane Calapatia; and Sound engineer Emerick Mangune. For donations and inquiries about the relief and rescue operation in line with Typhoon Yolanda, call the ABS-CBN pledge lines at 411-0013, 411-0014, 411-0015, 411-0182 or 411-0183. Keep tuning in to DZMM Radyo Patrol 630 and watch DZMM TeleRadyo (SkyCable Channel 26 and Destiny Cable Channel 25) for the latest news on the typhoon-struck cities. “DZMM Magkasama Tayo sa Kwento ng Pasko” Christmas Station ID airs this week on DZMM Radyo Patrol 630, DZMM Teleradyo and dzmm.com.ph. For updates, logon to dzmm.com.ph, follow @DZMMTeleradyo on Twitter or like www.facebook.com/DZMMTeleRadyo.